Paris, city of love and home of many cool french punk bands. For example these two rockers. This 12” was issued in 1982 by F.L.V.M. and we have fine well-produced mid-tempo punk from Les Cadavres with four powerful, accelerated singalong choruses numbers, excellent stuff. With short interruptions they have released lots of 7Inches + albums to date and according to my information they still alive. 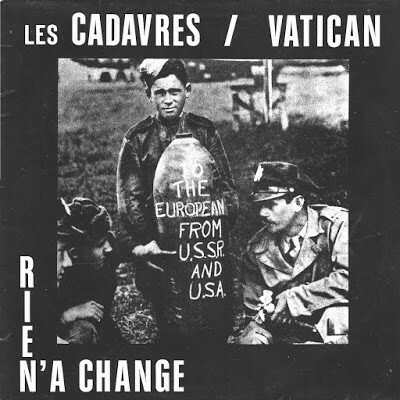 – The flip belongs to the Vaticans and in their short lifespan (1981-1984) they have not much recorded but this three tracks are pretty cool and excellent as well. Fazit: 1A punk rock sung in French with a touch of Oi! = fine release!